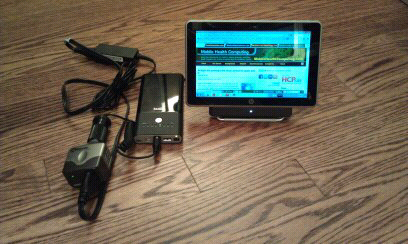 The HP Slate 500 is a great little tablet PC, but the battery is not user-swappable. So, if you run out of power, you need to find a wall outlet unless you use my solution to charge the Slate 500 using an external battery pack. The external battery pack will charge the internal battery on your Slate 500 when you're on the road (or on an airplane). Now, once you have all this together, you can plug your HP Slate 30W Power Adapter (QK186AA) into the Power Inverter and you'll have mobile power. Keep in mind that the external battery pack will charge the internal battery in the Slate 500. So, I would recommend using this method when the battery runs below 30% to maximize overall battery life.